Japanese mask ZO-ONNA. Wear ; Yes. 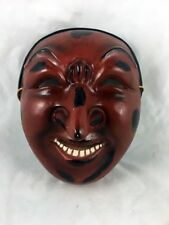 Japanese mask JYUROKU(16). Wear ; Yes. Length ; 20cm/ 8". We have collected the all kind of Japanese antiques. We will reply within 48 hours you.As soon as possible. Even though it happens rarely, we do make mistakes on occasion. We will make every attempt possible to resolve the issue if we made a mistake. Japanese mask CHUJYO. Wear ; Yes. CONDITION: GOOD WITH SLIGHT SCUFFS ON SURFACE AND SHOWING AGE, USUAL WEAR FOR AGE AND USAGE. IF YOU PREFER CHEAPER AND SLOWEST " SURFACE ". rest of the world: 2-3 weeks. also to get proper amount of compensation in case of item breakage. 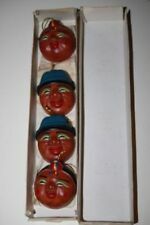 Japanese mask MAGOJIRO. Condition ;The paint has a small crack. Wear ; Yes. DESCRIPTION This is Japanese a old wooden Shakumi Female Mask. "Shakumi" is a Mask that represents a middle-aged woman who has experienced life as well as "Fukai".Shakumi is a woman older than Fukai. It is used in the role of mother. It is seen various expressions at the angle of light. It is likely to become a very wonderful companion for you. SIZE 21.4cm×14cm×7cm (8.42inch×5.51inch×2.75inch) total weight: 138g Condition: used / There is an aged deterioration.(faded,dirty). Japanese mask KOJYO. Wear ; Yes. Japanese mask OKINA. Wear ; Yes. Japanese mask KOKUSHIKIJYO. Wear ; Yes. Japanese mask HEITA. Wear ; Yes. DESCRIPTION This is Japanese a old wooden "Masukami" Female Mask. It is used in the shrine maiden on which the spirit of Tenma Tenjin (Sugawara no Michizane) was transferred, and in works such as Amaterasu Omikami. "Masukami" is an active goddess Mask. The power of God is increasing, and the hair appears disorderly and long and rough. It is an expressive Female Mask. It is seen various expressions at the angle of light. It is likely to become a very wonderful companion for you. SIZE 20.8cm×13.5cm (8.18inch×5.31inch) total weight: 180g (125g) Condition: used / There is an aged deterioration. The state is overall excellent. Japanese mask SHOJYO. Wear ; Yes. The Hannya (般若) mask is a mask used in Noh theater, representing a jealous female demon. The Hannya mask is used in many noh and kyogen Japanese plays, as well as in Shinto ritual Kagura dances. 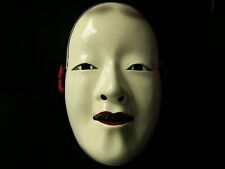 Plays in which a person may wear the hannya mask include Air no ue and Dojoji ; its use in these two plays, two of the most famous of the Noh repertoire, and its distinctive and frightening appearance make it one of the most recognizable Noh masks. Japanese mask SHIKAMI. Wear ; Yes. DESCRIPTION This is a Japanese Porcelain koomote(Female) Mask wall decoration ornament of Nagasawa Ujiharu. limited item. Nagasawa Ujiharu is a Noh masker who has created great Noh mask one after another through the study of Antique mask. He specializes in the Female Mask, and his facial expression and coloring are highly appreciated. In 1979, it was recognized as a holder of the country designated Important Intangible Cultural Property (Human National Treasure). Koomote mask is cute, meaning young and beautiful, the face of the youngest woman. It is an expressive Female Mask. Comes with a frame for hanging on a wall, a bag, a box and a bag. There is a signature. SIZE Mask:19cm×12.3cm×6cm (7.48inch×4.84inch×2.36inch) total weight: 1563g (mask:347g) Condition: used / There is a fade in the frame. Noh Mask KO-OMOTE. Title : Traditional Kabuki Beautiful lady Mask. Japanese WOODEN Signed. Material : Wood. DESCRIPTION This is Japanese a old "SEMIMARU" Noh mask. SEMIMARU is one of the program of Noh. This Noh program is a story of the prince SEMIMARU deserted to the mountain due to blindness. It is seen various expressions at the angle of light. There is a signature. SEMIMARU is a mysterious person, and Ogura Hyakunichika also has his poem written. It is an expressive Mask. It is likely to become a very wonderful companion for you. *There is a possibility that a color of the photograph and an actual color are somewhat different. SIZE ​21cm×13.2cm×6.5cm (8.26inch×5.19inch×2.55inch) total weight: 136g condition: used / Good antique condition with age appropriate wear and flaws. There is a stain on the whole. DESCRIPTION It is Antiques small Fox mask. It becomes made of porcelain, the jaw moves. It is a very rare ornament. There is a signature. *There is a possibility that a color of the photograph and an actual color are somewhat different. SIZE 5.5cm×4.9cm×4.5cm (2.16inch×1.92inch×1.77inch) Total weight: 164g (Fox:57g) Condition: used / The state is very good , considering the age. JAPANESE NOH MASK HANNYA. The mouth of this mask has a scratch of about 2 mm. The ear and around the mouth have dirt. And the right horn and the nose nose, cheeks and jaws have shallow paint peel-off (the bright part of the paint). I cannot send Mideast at the rate of Asia. All is shown in the picture. Japanese mask FUDO. Wear ; Yes. Japanese mask KOOMOTE. Wear ; Yes. Ichiryu Kajiwara is the best craft man about BURYU masks. Made by Ichiryu Kajiwara. Woman BURYU. It BURYU mask is a woman. High class mask. Depth ; 12 cm/ 4.5". Wear ; Yes. L ength ; 27cm/ 10.5". 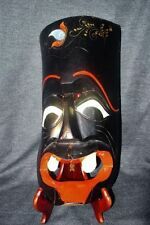 Japanese mask AKUJYO. Wear ; Yes. Wear ; Yes. L ength ; 21cm/ 8". DESCRIPTION This is Japanese a old wooden "SHOJO" Noh mask. SHOJO is the face of a fairy who likes alcohol. There is a signature. (Ansho) It is seen various expressions at the angle of light. It is likely to become a very wonderful companion for you. *There is a possibility that a color of the photograph and an actual color are somewhat different. SIZE 20cm×12.5cm×7cm (7.87inch×4.92inch×2.75inch) total weight: 767g (mask:162g) condition: used / There is peeling of paint at the tip of the nose. There is an aged deterioration.(faded,dirty). This is a truly exceptional mask that was used for Noh theater. Marvellous Noh Theater mask representing female. The mask is approx 21 cm height X 13.5 cm width. Japanese signed Noh Mask depicting Koomote character of a girl who is not yet twenty. Material: wood with gofun paint. Original wooden box include. Item: Noh Mask. Region of origin: Japanese. Material : Wood paper combnation. Item must be in original condition. Condition: Good antique condition with age appropriate wears and flaws.